The dramatic transformation of this Pelican Bay high-rise condo is striking from floor to ceiling. 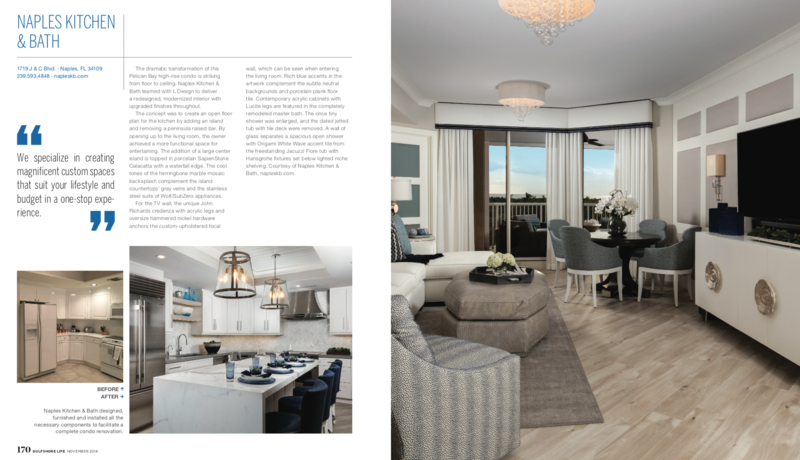 Naples Kitchen & Bath teamed with L Design to deliver a redesigned, modernized interior with upgraded finishes throughout. The concept was to create an open floor plan for the kitchen by adding an island and removing a peninsula raised bar. By opening up to the living room, the owner achieved a more functional space for entertaining. The addition of a large center island is topped in porcelain SapienStone Calacatta with a waterfall edge. The cool tones of the herringbone marble mosaic backsplash complement the island countertops’ gray veins and the stainless steel suite of Wolf/SubZero appliances. For the TV wall, the unique John Richards credenza with acrylic legs and oversize hammered nickel hardware anchors the custom-upholstered focal wall, which can be seen when entering the living room. Rich blue accents in the artwork complement the subtle neutral backgrounds and porcelain plank floor tile. Contemporary acrylic cabinets with Lucite legs are featured in the completely remodeled master bath. The once tiny shower was enlarged, and the dated jetted tub with tile deck were removed. A wall of glass separates a spacious open shower with Origami White Wave accent tile from the freestanding Jacuzzi Fiore tub with Hansgrohe fixtures set below lighted niche shelving. View more images of this project and more in our portfolio.